Do I Need A Pickup Truck? Welcome to a new feature we're calling "Flow on the Floor," where I ask our own Jason Torchinsky to answer random questions from readers, people I meet on the streets, and imaginary folks he thinks he's talking to — in a handy flowchart. Today he's answering: Do I need a pickup truck? — Ed. So, do you need a pickup truck? Good question. 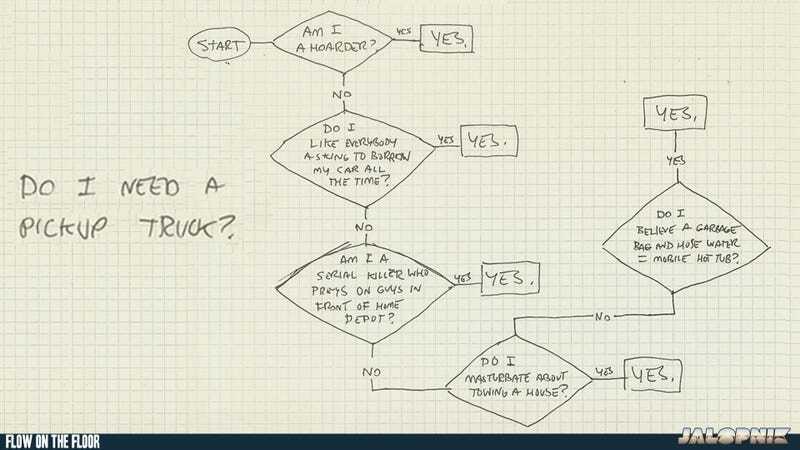 Hopefully, this flow chart should help you make your decision. Now remember, be honest!